"are made with 70% fruit, 30% grains and seeds, and nothing else." So let's take a quick and easy peek at those claims. 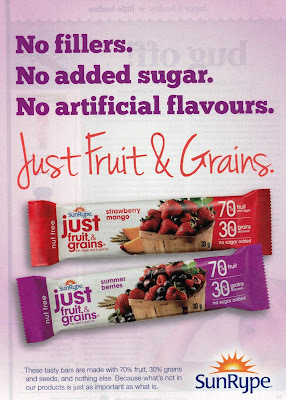 Each bar weighs 30g and of course, if the copy is to be believed, is made up purely of 70% fruit and 30% grains. So presumably, their Summer Berries bar would be 70% mixed berries and 30% grains and seeds. For the sake of this exercise let's assume of the grains portion 80% are rolled oats and 20% are flax seeds. That would mean 21 grams of mixed berries, 7.2 grams of rolled oats and 1.8 grams of flax seeds. 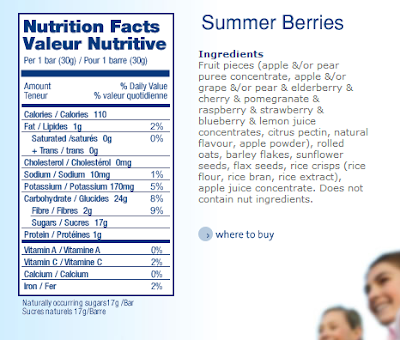 Nutritionally that mixture amounts to 59 calories and 1.9g of sugar. Pretty much double those calories and almost ten times the sugar predicted by just fruits and grains. So what's actually in the bars as clearly they're not simply my concoction of mixed berries, oats, and flax? Don't you think it'd be great if our government denied the food industry the ability to call concentrated fruit juices and purees "fruit" and forced them instead to label them as the simple sugars that they are? Oh, and in case you were curious, an equivalent 30g portion of a Mars bar? It has less sugar than this health-washed deception. If you're looking for fruit and grains, eat fruit and grains.